Thousands of demonstrators protesting US drone strikes in Pakistan blocked a main road Saturday in the Peshawar province used to transport NATO supplies to and from Afghanistan. 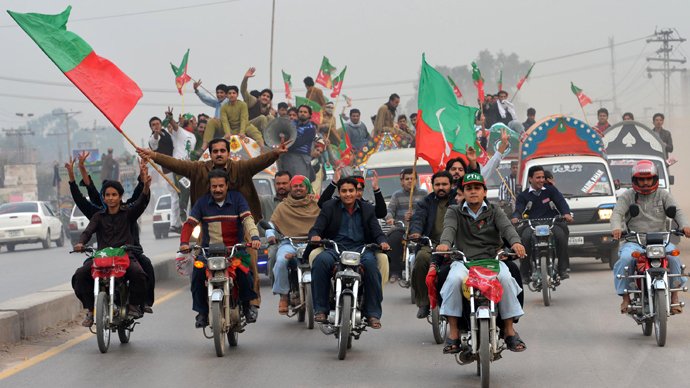 The protests was led by the Pakistan Tehrik-e-Insaf (PTI) party, which is led by Imran Khan, a former international cricketer now turned politician. They were supported by their allies in the Khyber Pakhtunkhwa provincial government and they were also joined by the Jamaat -i-Islami (JI) and the Awami Jamhoori Ittehad (AJIP) political parties. “We will put pressure on America, and our protest will continue if drone attacks are not stopped,” Khan told reporters. “We are here to give a clear message that now Pakistanis cannot remain silent over drone attacks,” said Shah Mehmood Qureshi, a senior member of the PTI, addressing the protesters. Imran Khan has been a fierce critic of US drone attacks, arguing that they violate Pakistan’s sovereignty. Khan said that the Pakistani government is doing nothing to stop drone attacks except for issuing statements of condemnation and that the protest would continue indefinitely. Khan stressed that NATO supplies would not be allowed to pass through Khyber Pakhtunkhwa, formerly called North-West Frontier Province, and added that the province’s PTI-led government had the mandate to block NATO trucks from passing through its territory. Earlier Imran Khan had warned that NATO supply routes will be blocked if continuing US drone strikes in Pakistan threaten the country’s peace talks with the Taliban. 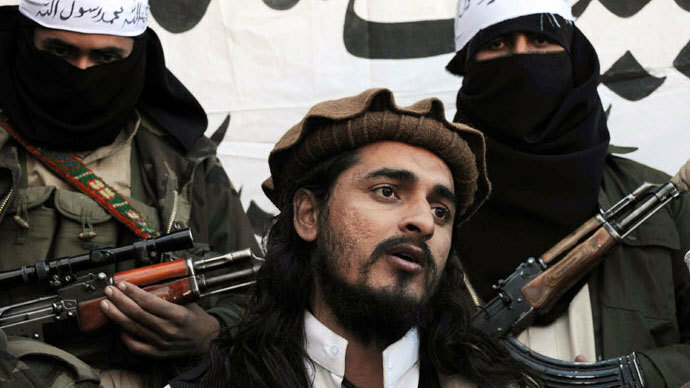 An attack on November 1 killed the former leader of the Pakistan Taliban, a day before the Pakistani government said it was going to invite him to peace talks. 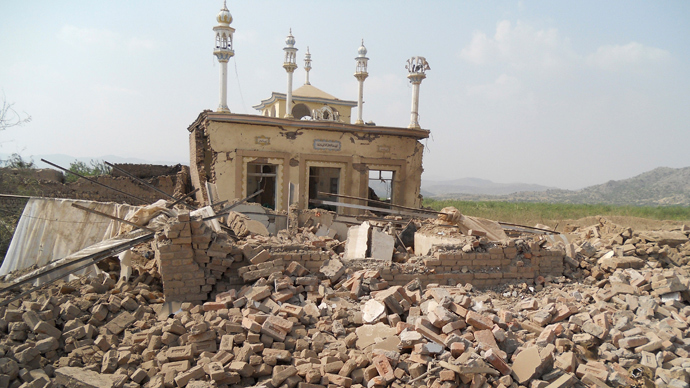 Officials said they were enraged by the attacks, although the Pakistani government is known to have supported some of the drone attacks in the past. Party workers from the PTI and the JI travelled to Peshawar from across Pakistan and an estimated 10,000 people participated in Saturday’s protests. The protesters shouted anti US slogans such as “Stop drone attacks” and “Down with America”. “I am participating in today’s sit-in to convey a message to America that we hate them since they are killing our people in drone attacks. America must stop drone attacks for peace in our country,” Hussain Shah, a 21 year old university student, told Dawn, Pakistan's oldest and most widely read English-language newspaper. American drones are performing regular extrajudicial killings of Islamist leaders, accompanied by the collateral damage of many civilian casualties. Strict security measures were in place Saturday, with 500 police personnel on duty. 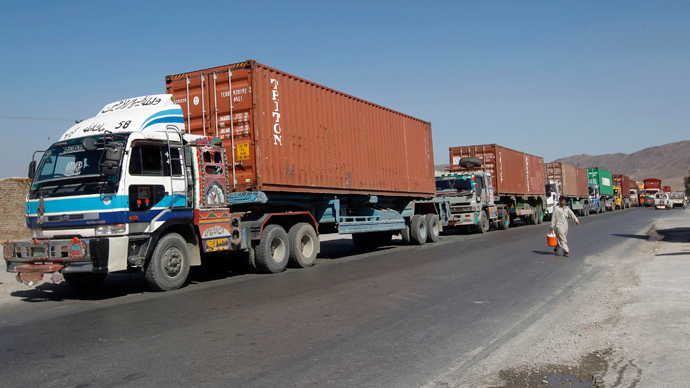 Trucks were directed to use an alternative route, although Tahir Khan, a government official, said there was normally little NATO traffic Saturday as most of the trucks arrive by Friday night to clear the border crossing. However, protesters said that they would begin to stop trucks carrying NATO supplies through Khyber Pakhtunkhwa from Sunday night, which could spark conflict with the federal government in Pakistan.